Trump: He's Not Lyin' Ted Anymore, He's Beautiful Ted - Joe.My.God. “He’s not ‘Lyin’ Ted anymore. He’s beautiful Ted,” Trump told reporters on the White House’s South Lawn. 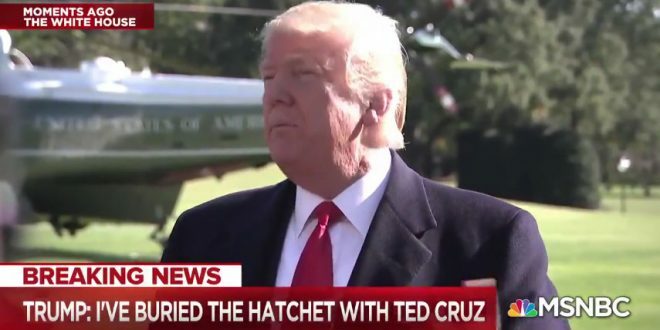 Trump also said that he calls him Cruz and “Texas Ted.” He said he doesn’t regret claiming that Cruz’s father killed former president John F. Kennedy. “I don’t regret anything,” said the president. On Monday night in Houston, Donald Trump will dunk on Ted Cruz one last time. Trump will travel to Texas to hold a massive get-out-the-vote rally for Cruz in the final days of a closer-than-expected race against Rep. Beto O’Rourke (D). For Cruz, the rally is borne of necessity — polling shows him with a mid-to-upper single digit lead over O’Rourke, but the incumbent badly needs an energized Republican base in order to ensure victory. And no one rallies the Republican base like President Trump. For Trump, it’s the latest example of a former political foe — and one who he attacked (and was attacked by) fiercely — seeking to make peace, with an acknowledgment that, well, standing against him just wasn’t worth it.